Led by the children and youth of Shadyside Presbyterian Church, this family service celebrating the Nativity of our Lord is filled with familiar carols, costumed players, and candle lighting. The service appeals to congregants of all ages and lasts approximately 45 minutes. 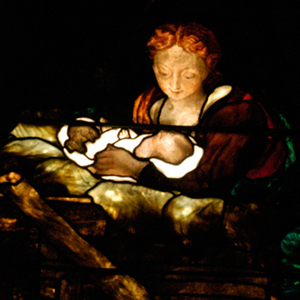 Photograph: Detail of Shadyside Presbyterian Church’s Nativity Window, located at the center of the south transept in the Sanctuary. Manufactured by Tiffany Glass Company, the window was installed when the church was erected in 1890 and is the only original stained glass window remaining at the church. The window is based on the 1522 painting “The Holy Night” (also known as “The Adoration of the Shepherds”) by Correggio, who was a contemporary of Raphael. Depicted are the Infant Jesus and His mother Mary. Those surrounding the Child are illuminated by a radiance that emanates from Him. Photograph taken by Mary Jane Bent.